Regardless of the size of your organization, the backbone of a successful cyber risk and security program is establishing robust policies and procedures, then following them. Proper definition of the organization’s baseline cyber security stance serves as a framework for best practices that must be followed by all employees, setting the rules and expectations for behavior. 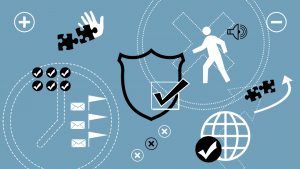 Good policies provide the guidelines for cyber security personnel to monitor, probe, and investigate when needed and defines the consequences of violations, helping manage risk. Most frameworks and regulations require policies and procedures to be documented, updated and followed in order to demonstrate compliance with best practice. Cyber security gaps often occur as a result of incomplete or missing policies and procedures, but it can be daunting to know where to start. The experts at TalaTek can help. Our seasoned industry experts bring decades of cyber security, risk and compliance experience and knowledge to the process of developing the required policies and procedures. They will work with your team to develop documentation based on industry best practices and your unique business needs. Investigate: We’ll start with a comprehensive examination of your organization’s business and regulatory requirements. Then we will follow with thorough interviews with you and your staff to better understand current practices and identify gaps with your desired future state. Develop: Next, we’ll rely on industry best practices to develop a complete set of information security policies and procedures, built to meet your business objectives. We’ll ensure these documents work within your culture and are suitable for you to implement, manage and scale. Review: Once complete, we’ll review in depth with your team, ensuring all cyber security and business objectives are met. Implement: Upon approval we’ll ensure your team implements the documented policies and procedures with your stakeholders across the organization in accordance with your risk management framework. Revisit: We’ll ensure you continue to meet your goals by reviewing and updating your policies and procedures at a regular interval, addressing the evolution of your business and your environment.